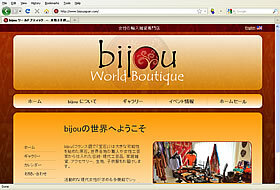 Online shop which sells handicraft, house wares, accessories, fabrics, jewelry and children’s wear. I had been trying to design my own site and finding it was too time-consuming and frustrating. I started looking for someone to work on my project with me. I was quoted ridiculous amounts of money and it wasn't until I found Website Design Japan that I found a decent rate, honesty, professionalism and quality of work. All I needed was to send in my content and everything was taken care of. Thank you for being so professional, responding to all of my questions and for providing me with the information and service I needed. This company cannot be compared to most website design companies in Japan, even if they were as competitively priced as this one! Thank you and I'll be back!